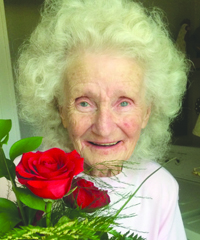 Eloise DeLoach Rushing, 94, passed away July 23, at Camellia Health and Rehab. She lived all her life in Evans County and was a member of Faith Baptist Church in Daisy. Ms. Eloise retired from Claxton Manufacturing Company and was a loving mother and grandmother. She was preceded in death by her husband, Charles Edward “Ram” Rushing; son, Charles David Rushing; granddaughter, Julie Perry; grandson, Dennis Perry; and step-daughter, Julia Herting. Surviving are her son, Albert (Penny) Rushing; two daughters, Charlene (Malcolm) Perry and Irene Cooper Kennedy, all of Claxton; five grandchildren, Dianne P. Hunter, James H. Cooper, Jason D. Cooper, Charles Rushing and Nola Rushing; four great-grandchildren, Kayleigh D. Hunter, Sophia Cooper, Thompson Cooper and Rush Cooper; several nieces and nephews. Visitation will be Saturday, July 28, from 1 – 2 p.m. at J. Mellie NeSmith Funeral Home. Funeral services will be held Saturday, July 28, at 2 p.m., at J. Mellie NeSmith Funeral Home Chapel. Burial will be in Brewton Cemetery Mellie NeSmith Funeral Home is in charge of arrangements.